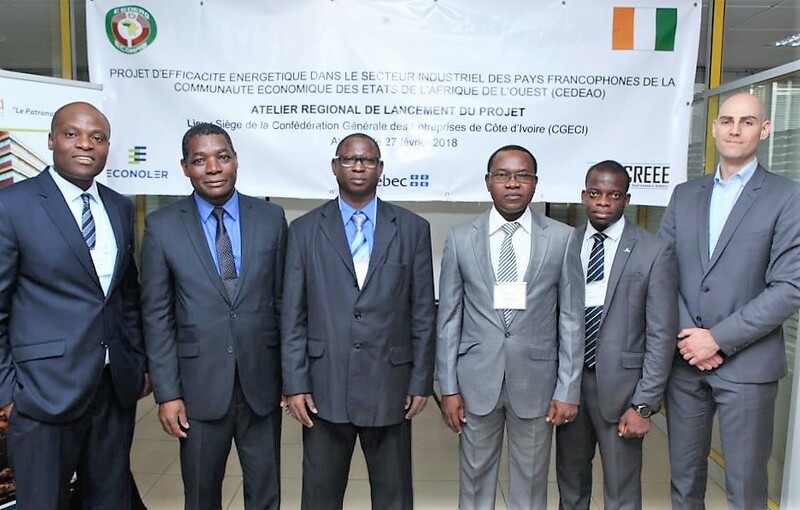 Excellent news from our experts Luc Tossou, Normand Michaud, Victorien Justin Agué and Laurent Kossivi Domegni who have just returned from Côte d’Ivoire where they took part in the Regional Launching Workshop of the Energy Efficiency Project in the Industrial Sector of the Eight French-speaking ECOWAS Countries. The workshop was a success for this project funded by the Government of Quebec under the Programme de coopération climatique internationale (PCCI). This project aims to accelerate the development of the EE market in the industrial sector of the sub-region through awareness-raising activities, capacity building activities among key stakeholders, as well as to establish pilot projects for the implementation of energy management systems based on the ISO 50001 standard in selected industries. From left to right in the photo: Luc Tossou ; M’Gbra N’Guessan ; Ibrahim Soumaïla ; Victorien Jutsin Agué ; Laurent Kossivi Domegni ; Normand Michaud.